1. Grind the grated coconut along with turmeric powder, chilly powder, coriander powder, pearl onions and tamarind to a very fine paste adding enough water. 2. 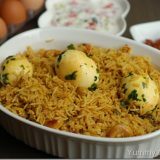 In a claypot / manchatti, add the fish pieces, ground coconut mixture, fenugreek powder, slit green chilies, drumstick pieces, curry leaves, salt and 1.5 – 2 cups of water. Mix well and cover with a lid. Bring to a boil and cook for a few minutes. Bring down the flame to medium-low and cook until done. Add 1 – 1.5 tbsp coconut oil and a few curry leaves. Set aside for 15 minutes. 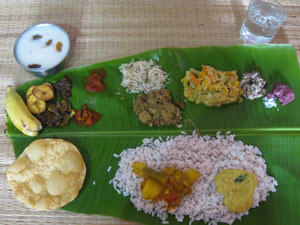 Serve with rice and a thoran/mezhukkupuratti. Slurp,mouthwatering here, such an irresistible fingerlicking fish curry. So inviting and yummy !!!! Very different from wht i make. Definitely going to try this out. looks yummy…if i’m using Tamarind pulp how many tbsp? I guess you’ll need to use only around 1.5 – 2 tsp tamarind extract for this recipe.. I am a great fan of your blog and was following it since you started yummy o yummy.I have tried most of your dishes and turned out great especially your kerala prawns curry and Trivandrum style fish curry.My 4 year old loved the prawns curry i made following your recipe.You are doing a great job.Wishing you all the best. Thanks a bunch for trying out my recipes and for letting me know! 🙂 Hope you continue to enjoy the recipes here..
” … and cook until done.” What time would you recommend? Hi this is a new version of fish curry for me, i have a doubt . Which type tamarind is used in grinding here?is it kudampuli or valampuli? And anyway to prep the tamarind or just put it in? Maya … question from a non-God’s Own Country native: what are Kudampuli and Valampuli? Pictures or links to them would be helpful. THAT IS A VERY EASY FISH CURRY. TRIED AND CAME OUT EXACTLY LIKE MY MOTHER’S RECIPE. THANKS A TON. You’re welcome! Glad that you enjoyed it..